The New York City subway system is a mess, and now instead of reading about why that is, you can play a very simple game and experience it yourself. 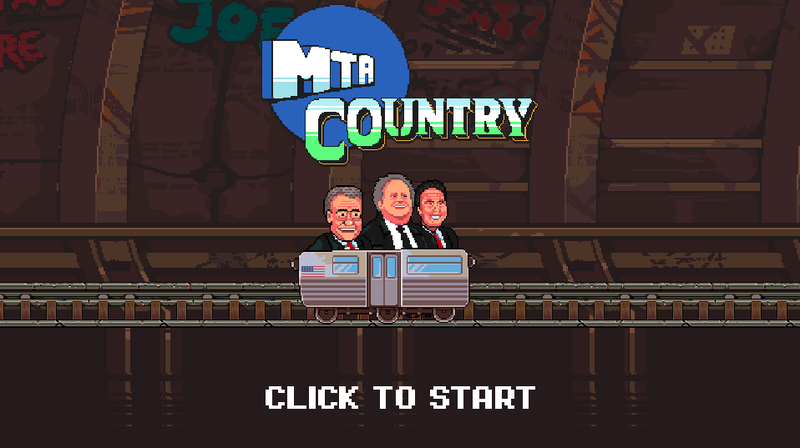 It’s called “MTA Country,” and it’s hell. It’s tongue-in-cheek solution, revealed once you win the game, isn’t any better. Those familiar with the Metropolitan Transportation Authority’s safety ad campaign are probably familiar with the video game’s main character, “Gregg T.” Gregg needs to get to work, and so he’s joined by his pals Andrew Cuomo and Bill de Blasio—close friends who share a deep bond over fixing the subway system—to help navigate the subway to arrive on time. I died at least a dozen times in my effort to collect coins and letters on the track, the latter eventually spelling out the word “privatize” (ugh). And that’s the catch: once you collect P-R-I-V-A-T-I-Z-E, the system transforms into a brand new, super fast, totally non-existent “Hyperloop” system. That’s somewhat of a joke, the game’s co-creator told the New York Post. The game was created by Everydayarcade, a creative collective of advertising professionals who make hot-button video games in their spare time. The hyperloop at the end is kind of a joke but also kind of not a joke, said co-creator Chris Baker. Another co-founder of the game, Mike Lacher, at least conceded to The Verge there is a benefit to the subway system. Anyway, at least the game will kill some time on your day back after a long holiday weekend.